Seniors may have helped build the nation, and the Greatest Generation may have thwarted global tyranny, but a changing world is now putting their dreams in jeopardy. Is this fair? 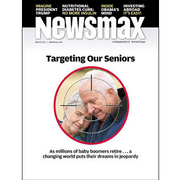 Newsmax magazine's special report "Targeting Our Seniors," by New York Times best-selling author Ted C. Fishman, takes an in-depth look at the changing demographics of the nation and the problems seniors increasingly face — including the threats to the Medicare and Social Security older Americans have come to rely on. This issue of Newsmax magazine also features "Imagining a Trump Presidency," which examines Donald Trump's possible run for the White House in 2012 and includes excerpts from Trump's recent fiery interview with Newsmax.TV. The dramatic shift toward work after "retirement"
Obama's looming power grab — "regulatory stealth"